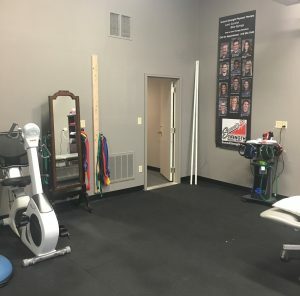 Summit Strength Physical Therapy, LLC is conveniently located with easy access from all areas of Kansas City. Our Lee’s Summit building is adjacent to Extreme Fitness and Glory MMA & Fitness—just north of Chipman on Main Street in Lee’s Summit. Our facility has 12,000 square foot of treatment rooms, waiting area, work and sports injury treatment and conditioning area. Our Blue Springs location is inside the Blue Springs Fitness Center at 1300 NW State Route 7 Ste 100, Blue Springs MO 64014–just north of I-70 on 7 Highway. Patients also work with equipment in the Blue Springs Fitness area while in therapy.